Underhill, Vermont – Barbara Kroll Dyck Goss, 90, died Saturday, September 24, 2016, after an extended illness. She passed away peacefully, in her home, attended by the caregivers who had looked after her faithfully for many years. She will be greatly missed and dearly remembered. Barbara was the daughter of Rev. William Ernest Kroll and Mary Hill Kroll. She was born in Holyoke, Massachusetts and grew up in East Orange, New Jersey. She had a younger brother William E. Kroll, Jr. She graduated from Columbian School, Clifford Scott High School, and Mount Holyoke College. She married Walter Dyck in Denver, Colorado, in 1948. They also lived in Boulder, Colorado and Wichita, Kansas before moving to Vermont in 1957. They had three sons: Peter, Christopher, and Timothy, whom they reared primarily in Johnson, where Walter was a college art professor, and later in Underhill. Barbara and Walter divorced in 1967. Barbara loved to teach and enjoyed her career as an elementary school teacher. 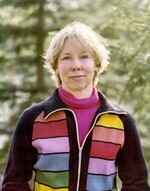 She taught second grade at Champlain School in the Burlington, Vermont school system from 1967 until 1998. In the early 1970s, Barbara met Frank Goss, who owned the Onion River Pottery. They enjoyed many years together before officially marrying in 1987. They shared a love of choral music and sang with various choral groups, including the Vermont Choral Union. They also shared a love of sailing their boat on Lake Champlain, as well as chartered boats in the Caribbean. Barbara also loved square dancing, folk dancing, and playing tennis. After retiring from teaching, Barbara enjoyed working with her husband, Frank, at the Shelburne Museum, Shelburne, Vermont. She was also passionate about her Brittany dogs, Penny, Goldie, Prizie, Star, and Sherry, and she loved taking them to AKC dog shows, where several of them became champions. She was preceded in death by her parents and younger brother, as well as her first husband, Walter, and her second husband, Frank. She is survived by her sons: Peter van Dyck (Tammi), Christopher van Dyck (Amy Arnsten), and Timothy van Dyck (Barbara); and her grandchildren: James, Laura, Seth, Juliana, Max, Katie, and Sam. Funeral arrangements have been made with A. W. Rich Funeral Home, Essex Junction, Vermont. A memorial service is tentatively planned for spring. Please contact Peter van Dyck, PO Box 80155, Raleigh, NC 27623 to be notified when the memorial service is scheduled.